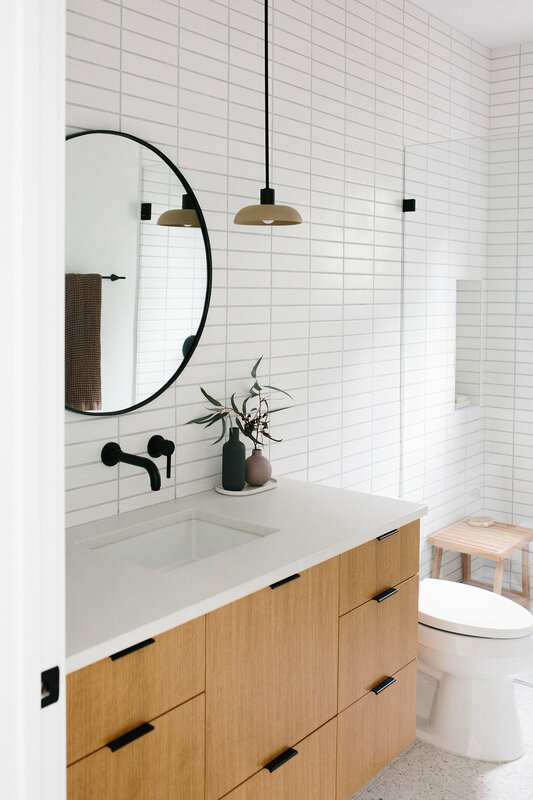 We went with a really modern and simple design in here– stack bond 2×8 white tiles for the walls in and matte black Delta faucets in addition to the terrazzo tile floor made for a perfect starting point for the rest of the space. Next, I really wanted to warm it up with a warm wood vanity and these tan terra pendants from Cedar & Moss. Honestly, if I could only choose one lighting source to use for the rest of my life, it would be Cedar & Moss. I love, love, love all of their lighting selections, especially these clay pieces which are a bit newer. We have sconces in the other two bathrooms, so I liked the idea of doing something different here with the pendants. The mirror is from Rejuvenation, another shop that I could likely source my whole house from. Just such great pieces and quality. So now I have to know, which bathroom is your favorite?! This design or the master?! Do tell! Love both but I have to agree with aaron…this one is bananas amazing. Love it. I just updated the link! I think it was linking to a smaller version earlier! I love this so much! 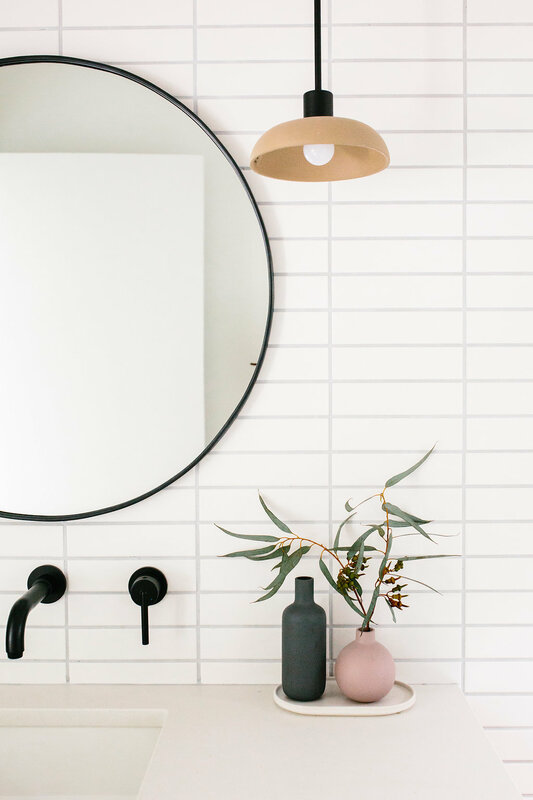 What grout color/brand did you use for the walls? 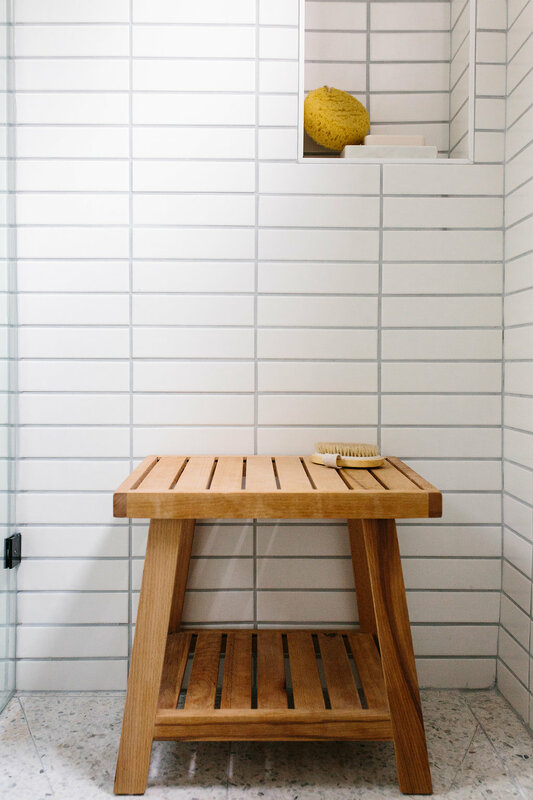 The grout color is platinum on the floors and walls– I think it’s a universal color for all brands. Just a heads up- I think the H&M vase links are not the same vases in your photos. I bought them from the link and was shocked how small they ended up being. Oh no! I’m so sorry about that Madeline! I just updated the link! I am a new reader and i’m finding your site amazing. your home is like my dream home… mid-century design with an organic feel. 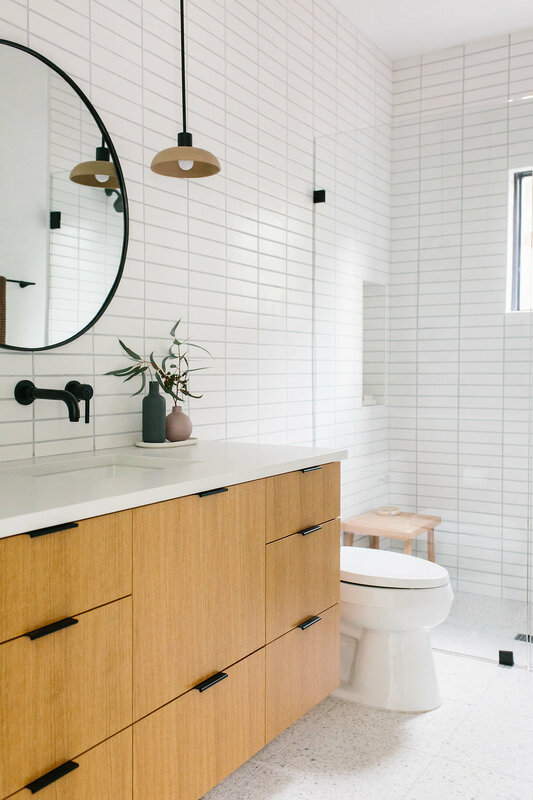 I even gasp when I saw that you INPUTTED terrazzo floors in your bathroom! I love that you kept mid-CENTURY touch while still KEEPING it modern. I’m obsessed with this bathroom. Thanks so much for sharing the resources! One question: Do you happen to know what the tile trim pieces are around the Niche? I’ve been searching online for something like that and I’m just not finding anything that long. Hey Kris! I don’t off the top of my head. Let me do some digging! Love this bathroom! Who is your cAbinet guy? We’re remodeling our master bath right now and i’m not liking the semi-custom options i’ve seen. I Would love tO use a talented local craFtsman. This is my FAVOURITE for sure! 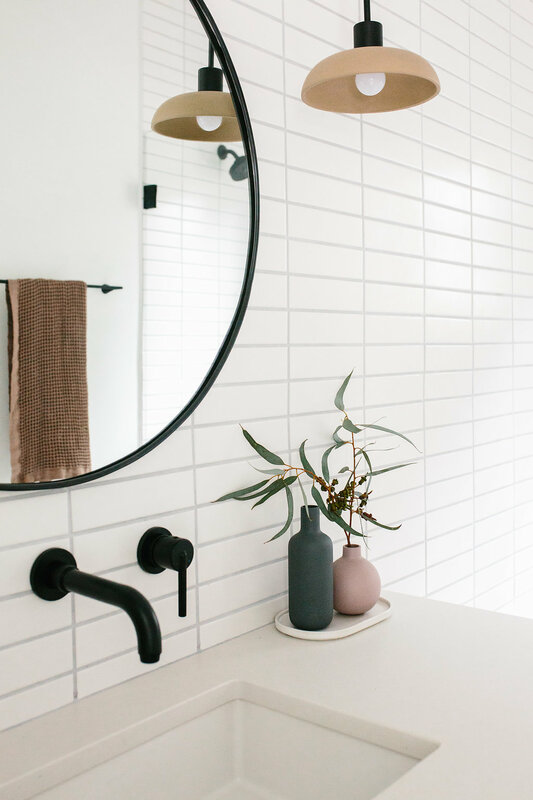 In fact, i think I’ve just tweeked our CURRENT BATHROOM renovation to incorporate some of the things i love about this room. 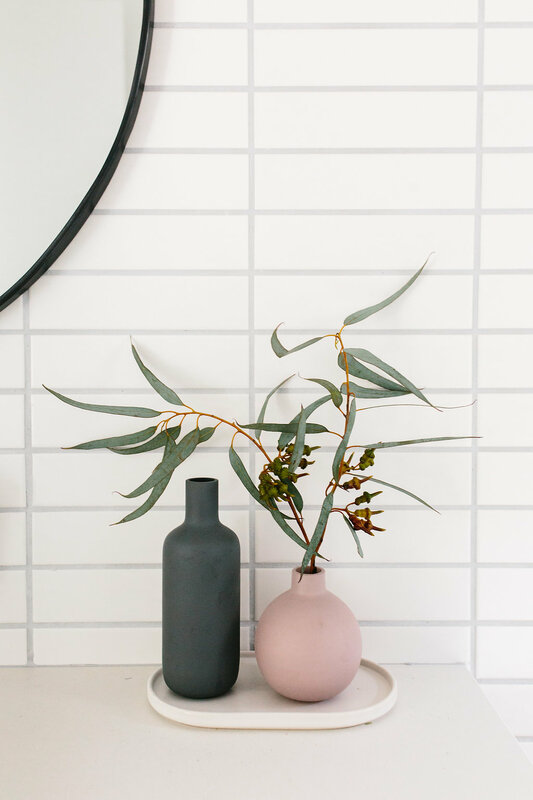 Would love to know if your wall tiles are matt or gloss? Thank you! Oh boy, I love this bathroom so much! Every detail is perfect. I especially adore the terrazzo. Curious: did you apply any nonslip stuff to it? If not, have you found it to be slippery? Hey Anne! We actually didn’t apply anything to the surface. It’s a guest bath so it doesn’t get used that often. When my nephew spends the night, we always put out a floor mat, but otherwise it stays how you see it here and we haven’t had any problems. That said, I can see how it would definitely be slick when wet. What grout colour anD brand did you use? I’m in Love! This is my dream bathroom. You nailed every it! From the floor, to the mIrros And right down to the Drawer pulls. INcreDible! 1)what color Is that Countertop and which brand? 2)the cedar & Moss lights. You mention you used the color Sand but i’m not seeing that color on the site. They have bone listed. Is that the one you used? Thank you so much for sharing a peek into your home with your followers! So appreciated! 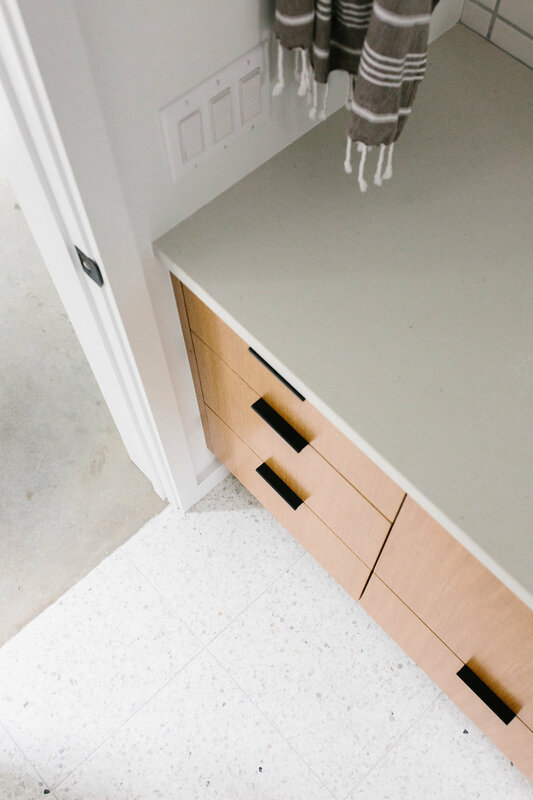 Hi Anegla, the countertop is Caesarstone Fresh Concrete. As for the Cedar & Moss lights, it looks like they aren’t carrying that color way any longer. The bone is definitely a lighter, creamier hue than these are, but still a nice neutral! We love the Casa Austin bathroom. 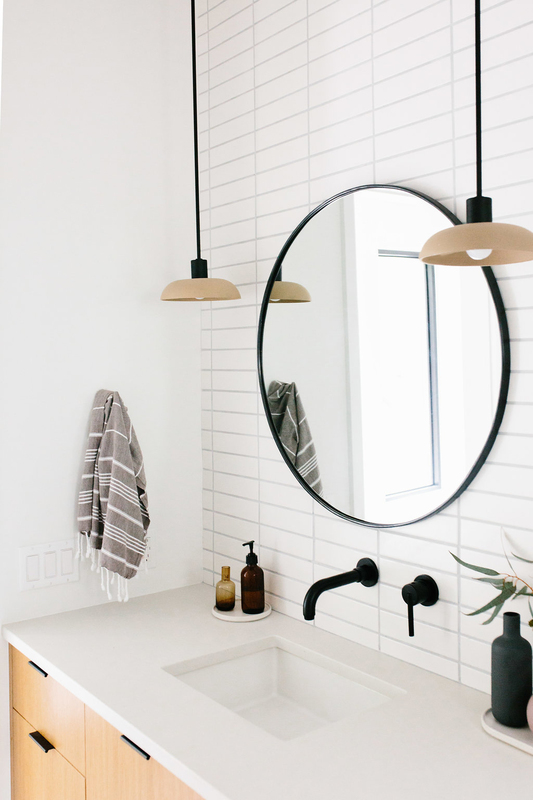 What grout brand and color did you use for the walls? Sorry for the all caps, but I can’t seem to type in this window with lower case. I even pasted from a text document. Hi Mark, I’m not sure of the brand but the color is Platinum and if I remember correctly I think our builder said that grout colors are universal across brands. I hope this helps! hello -love the bathroom. 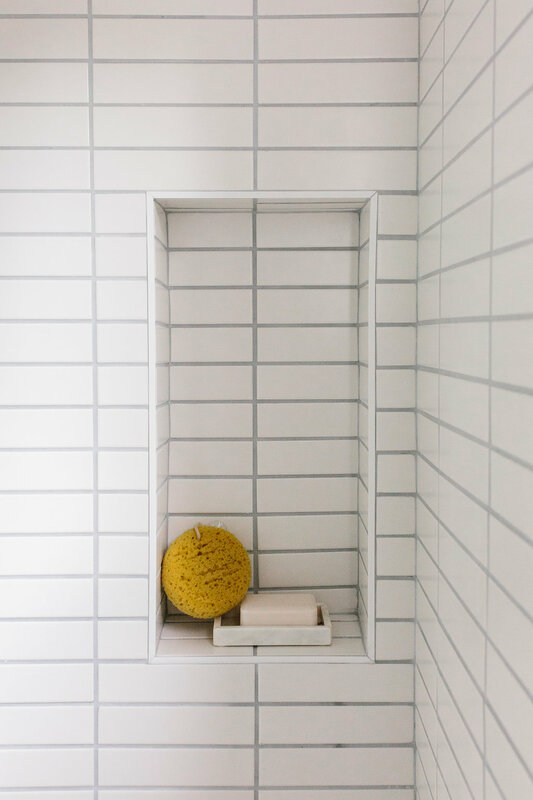 YOu commented that tile is an interceramics white matte tile subway tile on the walls. Could you give a bit more detail on the collection size and color. 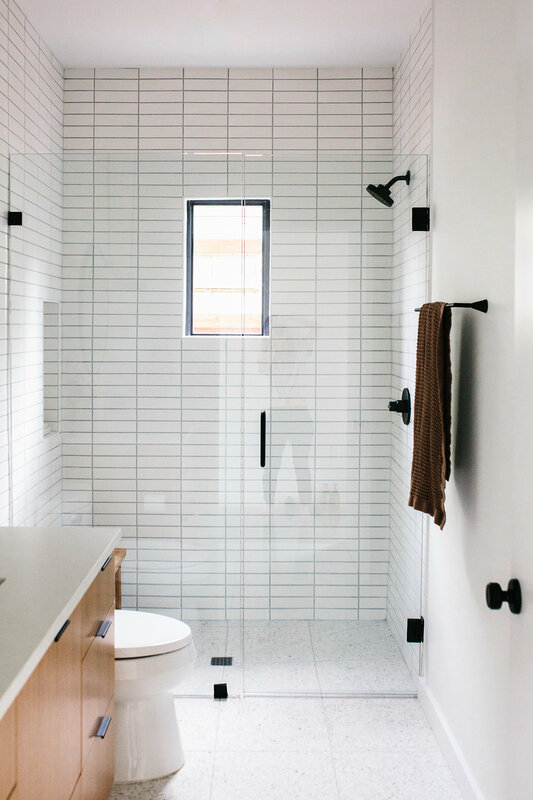 What is the series, color and size if the matte subway tiles on the wall? Appreciate the site and information. Hi Mark, I’m not sure about the series but the color is just white and size is 2 x 8. What grout thickness did you use? It looks like 1/4 inch. I LOVE THIS BATHROOM. COULD YOU PLEASE TELL ME THE DIMENSIONS OF THE SHOWER?